Sarah Crichton Books, 9780374118327, 240pp. That’s what The New Yorker’s Andy Borowitz calls Jenny Allen—and with good reason. In her debut essay collection, the longtime humorist and performer declares no subject too sacred, no boundary impassable. With her eagle eye for the absurd and hilarious, Allen reports from the potholes midway through life’s journey. One moment she’s flirting shamelessly—and unsuccessfully—with a younger man at a wedding; the next she’s stumbling upon X-rated images on her daughter’s computer. She ponders the connection between her ex-husband’s questions about the location of their silverware, and the divorce that came a year later. While undergoing chemotherapy, she experiments with being a “wig person.” And she considers those perplexing questions that we never pause to ask: Why do people say “It is what it is”? What’s the point of fat-free half-and-half ? And haven’t we heard enough about memes? Jenny Allen’s musings range fluidly from the personal to the philosophical. She writes with the familiarity of someone telling a dinner party anecdote, forgoing decorum for candor and comedy. To read Would Everybody Please Stop? is to experience life with imaginative and incisive humor. 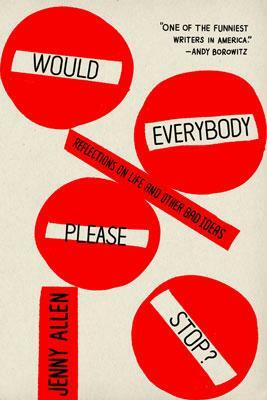 Jenny Allen is a performer, and the author of Would Everybody Please Stop? : Reflections on Life and Other Bad Ideas. Her articles and essays have appeared in The New Yorker and The New York Times, among other publications. Her award-winning solo show, I Got Sick Then I Got Better, has been seen in venues across the country and in Canada. She lives on Martha’s Vineyard, Massachusetts.